While working with layers, you may want to align specific layers with the camera, so any time you adjust the camera, the layer is always in full view. You can set a different alignment for each layer. The default behaviour is that the camera is not aligned with layers. In the top-right corner of any view, click on the Add View button and select Layers. In the top menu, select Windows > Layers. In the Layers view, select a layer to align with the camera. No Alignment: The layer is independent of the camera. If the layer is set to No Alignment and you switch to Face Camera, the offset and scale is retained but the rotation is removed.If the layer is set to No Alignment and you switch to Pin to Camera, all layer transformation is reset and animation is removed. If the layer is set to No Alignment and you switch to Pin to Camera, all layer transformation is reset and animation is removed. Face Camera: The layer is oriented to face the camera, so it rotates around its pivot point to always face the camera, but does not move with the camera. 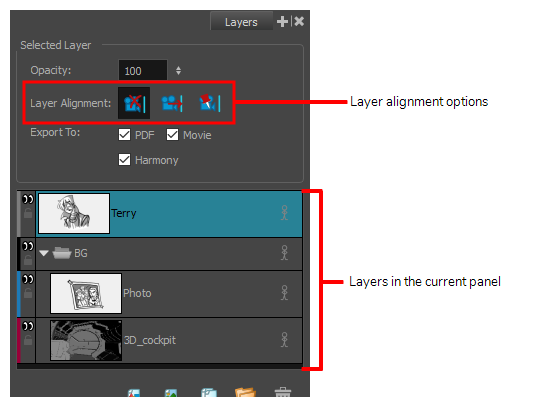 If the layer is set to Face Camera and you switch to Pin to Camera, all layer transformation is reset and animation is removed. If the layer is set to Face Camera and you switch to No Alignment, the offset and scaling are retained. You should change the rotation keyframes so the layer faced the camera at the current frame. Pin to Camera: The layer is oriented to the camera's perspective. Essentially the layer always moves with the camera. If a layer is set to Pin to Camera and you switch to No Alignment or Face Camera, the layer stays at its position at the current frame. If a layer is set to Pin to Camera and set it back to No Alignment or Face Camera, the layer transformation is combined with the camera. The layer is left in place at the current frame.